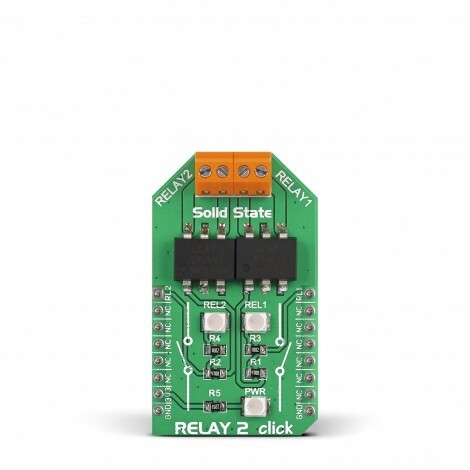 Relay 2 click is a dual relay click board™, equipped with two single-pole solid state relays (SSR), built with the patented OptoMOS® technology. These SSR devices allow reasonably high current, up to 2A and voltage up to 30V (peak-to-peak). These relays also allow very fast switching time, thanks to the absence of any moving parts inside of them. Compared to a mechanical relays, solid state relays offer a whole range of advantages, such as very high reliability, arc-free operation with no snubbing circuits required, great input/output galvanic isolation, no EM/RF interferences, low driving power needed, resistance to wear over time since they do not use any mechanical parts, and much more compact sizes, compared with the traditional mechanical relays. Equipped with two SSRs, the Relay 2 click is an ideal solution for power switching in both DC and AC applications. Due to its low power requirements, it can be controlled by the MCU pins, directly. It allows implementation of the MCU controlled power switching applications, such as the switches for the instrumentation and sensor circuitry power control, various I/O subsystems, control of various embedded electronic applications, and similar cases where reliable and clean power supply control is required. 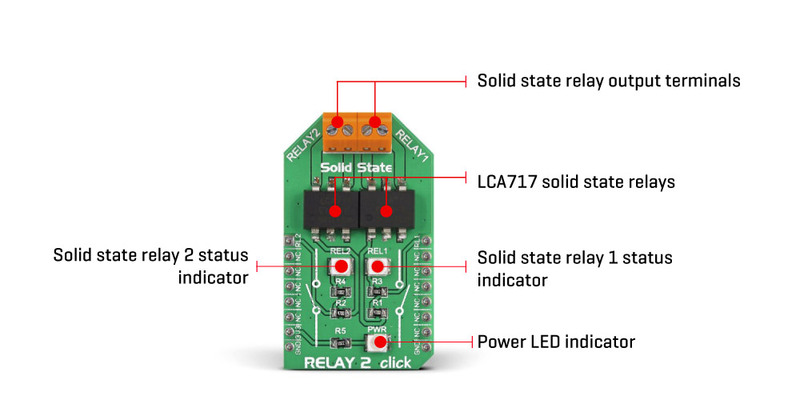 Relay 2 click contains two LCA717 single poles OptoMOS® solid state relays (SSR), from IXYSIC. These SSRs are normally open, which means that there is no current flowing through the output terminals if no power is applied at the input - the output stage is in a state of an open circuit. The LCA717 itself is built with the patented OptoMOS® technology, that allows for a reasonably fast switching time to be achieved by the output stage. The input stage of the device is comprised of a highly efficient GaAIAs infrared LED, used to drive the photovoltaic elements of the SSR. The output stage has two N-type MOSFETs, which allow both DC and AC to be switched to the output stage. Input and output stage are galvanically isolated with up to 3.5kV of breakdown voltage. The PWM and the AN pin of the mikroBUS™ are routed to the anodes of the integrated IR LEDs of each SSR, while the cathodes are connected to the GND. A positive voltage on these pins (in respect to the GND) will activate the first and the second SSR respectively. As already mentioned, the output MOSFETs are configured so that they can work with both AC and DC power sources. Therefore, the middle output of the LCA717 is not connected (NC). The input lines are also used to drive two LEDs labeled as REL1 and REL2, so the HIGH logic level on the PWM and AN pins will be indicated by these LEDs. 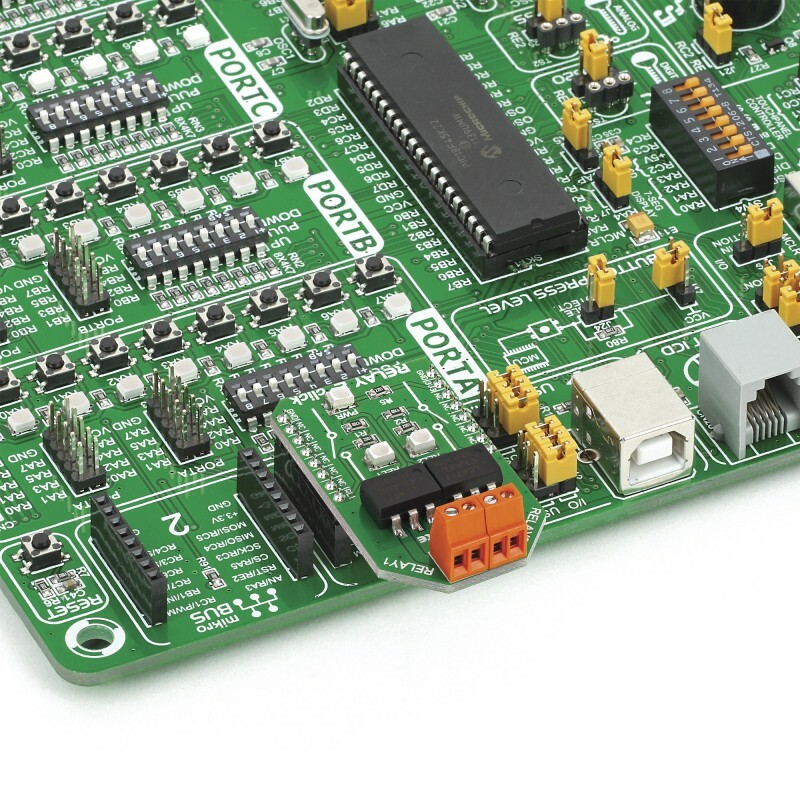 This click board™ contains two screw terminals so that the two external loads can be securely connected. 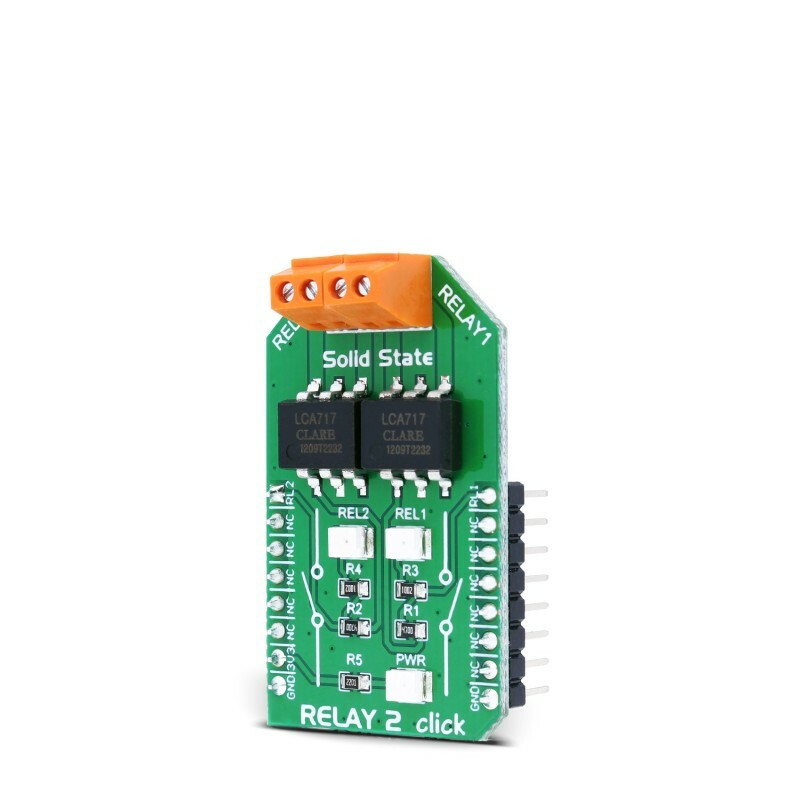 Although the control of the Relay 2 click is very easy and straightforward, there is a click library provided, which contains functions for even simpler control of the Relay 2 click. The included example demonstrates the usage of this click board™ and can be used as a reference for custom projects. Applications It can be used as a MCU controlled switch for the instrumentation and sensor circuitry power control, various I/O subsystems, control of various embedded electronic applications, and similar cases where reliable and clean power supply control is required. 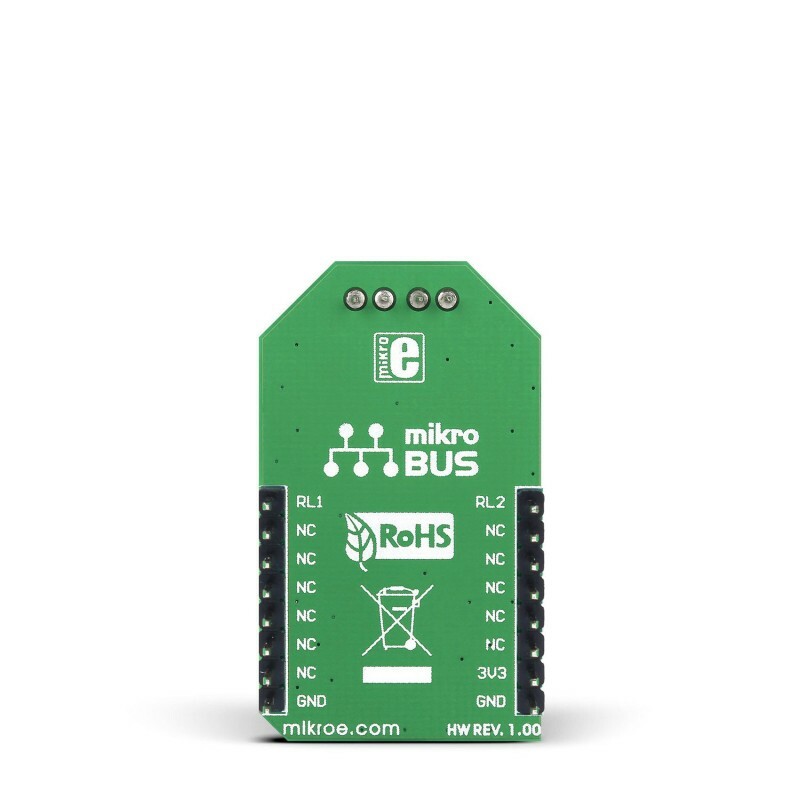 This table shows how the pinout of Relay 2 click corresponds to the pinout of the mikroBUS™ socket (the latter shown in the two middle columns). We provide a library for Relay 2 click on our Libstock page, as well as a demo application (example), developed using MikroElektronika compilers. The demo can run on all the main MikroElektronika development boards. The library offers an option to control the state of relays. void relay_relay2Control( uint8_t pinState ) - Controls the Relay 2 pin. void relay_relay1Control( uint8_t pinState ) - Controls the Relay 1 pin. System Initialization - Sets pin directions. Application Initialization - Initializes driver. Application Task - Turns relays on and off.